There is just so much to say. I almost feel bad for my Chickpea and Raw Vegetable Salad because if these two got into a bar fight it would get OWNED. 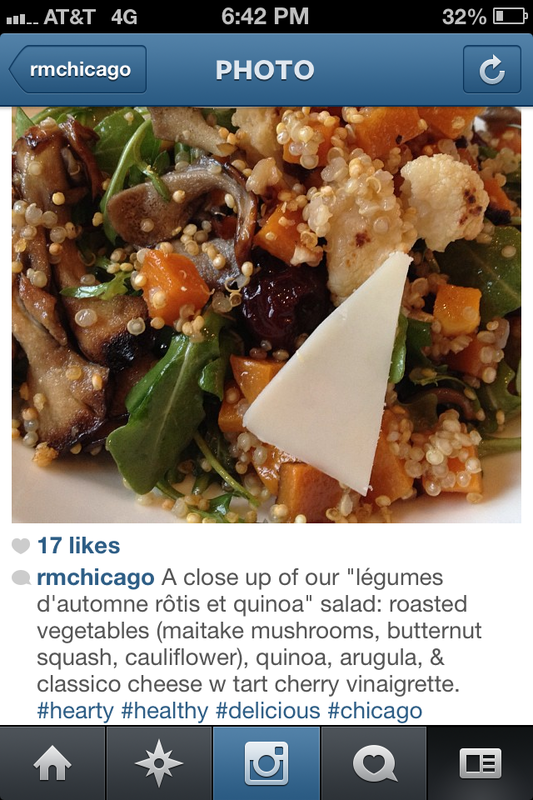 Yea it’s not exactly a fair fight- the raw vegetable salad is a great cleanse situation but this salad is just INSANE. Well… how can I not get involved in that? I made a reservation ASAP but clearly this is not something I could wait to taste which is how it came to be in my kitchen. It’s unclear whether I made it how they do or if it tastes remotely similar but I am certainly not mad about how it turned out. And by not mad I mean I ate nothing else for three days after making it. I barely shared. 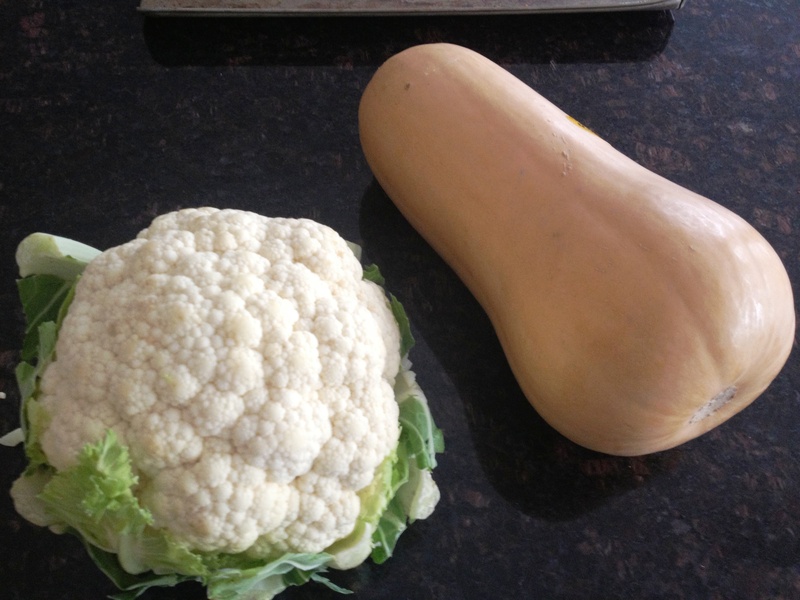 Place squash and cauliflower on a baking sheet and toss with olive oil (a couple tablespoons for each), salt and pepper. Roast at 400 degrees F for 30 minutes or until they are done (taste test always best). Cook the quinoa in the stock (or water) according to the package. I bring the stock and quinoa to a boil over high heat and then cover, reduce to low for 15 minutes and fluff with a fork. While this is happening soak the dried cherries in the red wine vinegar for half an hour. Heat up a few tablespoons of olive in a large sauté pan over medium-medium high heat. Saute the mushrooms until cooked through. 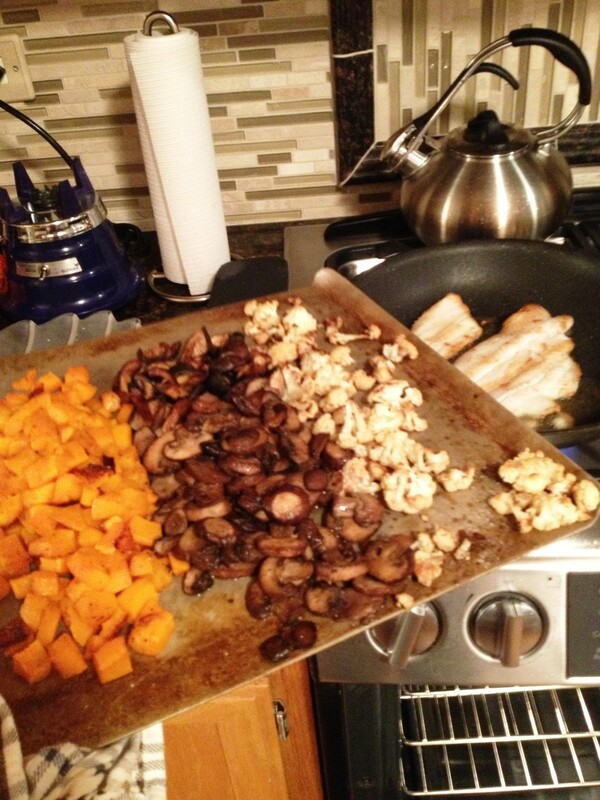 I did this in three batches so the mushrooms would not steam from an overcrowded pan. Set aside. Roughly chop the cherries and whisk with the red wine vinegar you soaked them in, the balsamic vinegar and sherry vinegar. Slowly whisk in the olive oil. Salt/pep to taste. 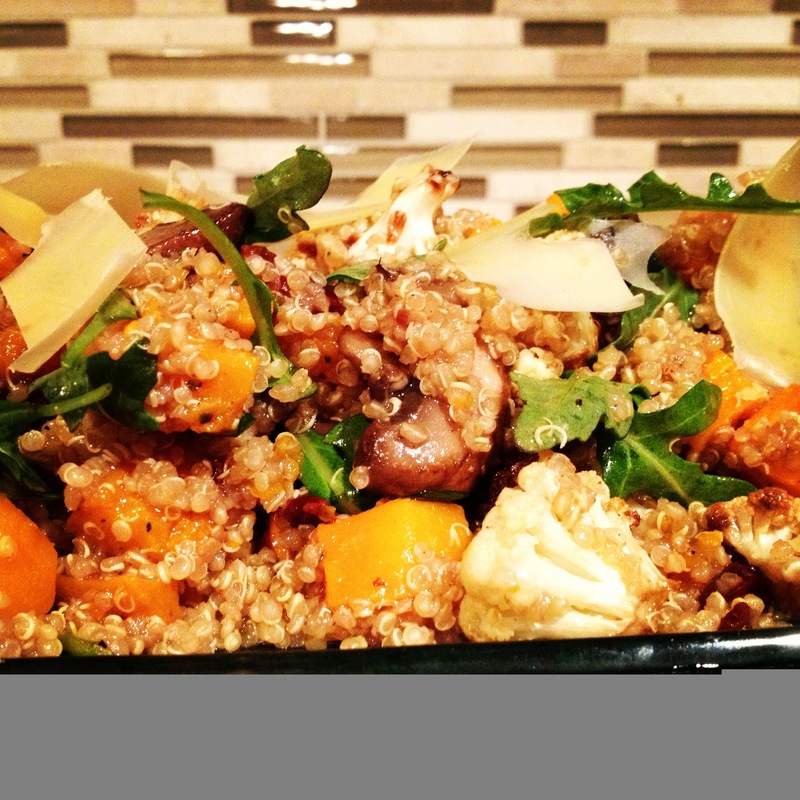 Toss the squash, cauliflower, quinoa and mushrooms together. Already I am freaking out at this point because the vegetables each have such a different texture I know my mouth is going to explode. Add the dressing. Remember you can always add more dressing but you can’t take away so don’t go crazy all at once. 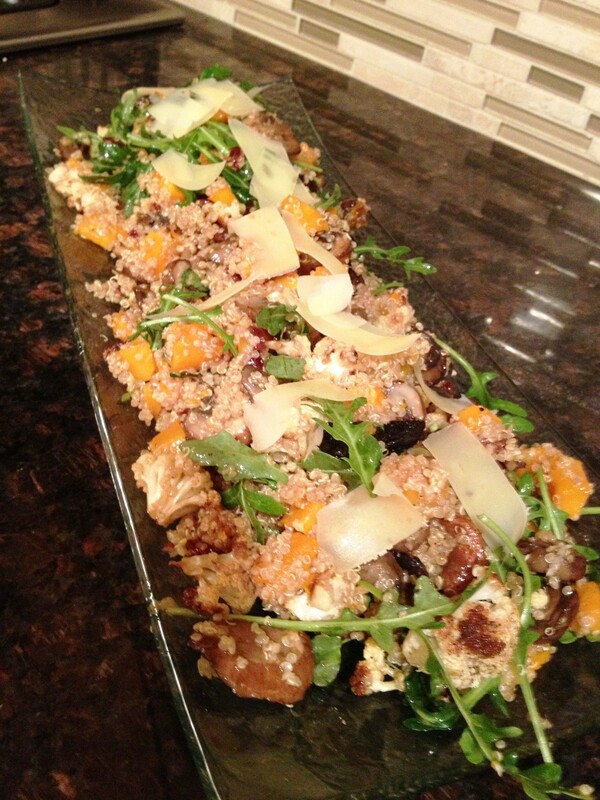 Add in the arugula and toss lightly. Using a vegetable peeler shave large pieces of the comte cheese over the top. I served this warm with a piece of fish and it was everything I wanted. Then I had it the next day for lunch cold and couldn’t believe it had gotten EVEN BETTER. As someone who also enjoyed partaking of this delightful salad, I can attest to it’s awesomeness. The dressing was particularly good!